72" Performance Workbench from Kendall Howard. Comes with Full Bottom Shelf only. For these accessories, (as shown in above photo), please choose your options. This completely modular system allows you to design virtually any layout suitable for your environment. Each bench frame is made from only the highest quality American-Made tube steel welded and assembled right here in our St Paul, Minnesota manufacturing facility. Patent pending open frame design, Universal preset accessory mounting holes, Knock down design allows for easier transport to your facility, Ships in a fully enclosed crate to ensure no shipping damage, Easy-to-follow directions; Assembles in less than 20 minutes. 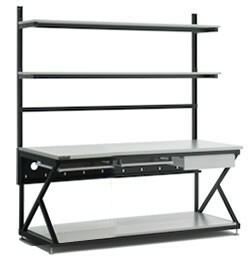 Fully adjustable upper shelving in any increment and has a 7-layer laminate coating on the main surface to protect against damage. 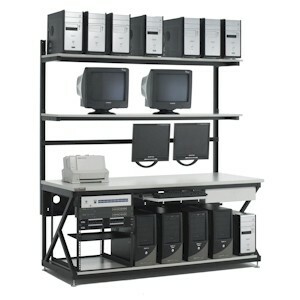 Performance Racking System: Turn your Kendall Howard Performance LAN Station into a fully functioning Data Rack! Just bolt this unit under your LAN station with the preinstalled mounting hardware and in minutes, you have 13U of mounting space right at your feet! Performance Accessory Bar: Specially designed for exclusive use with the Kendall Howard Performance Series Lan Stations, this will allow you to mount most Kendall Howard bar-mounted accessories with ease! Adjusts to any height. Performance LCD Monitor Mount: Designed specifically to mount onto our Performance Accessory bar. Features the easiest installation available, a 10 year manufacturer's warranty and sleek, low profile designs. Just choose how much articulation you need from your mounting solution. 360 degrees of swivel (portrait to landscape), Up to 40 degrees of tilt (varies depending on monitor size), 75mm and 100mm VESA compliant, 40 pound maximum load, or LCDs up to 30", and contains the following: Tilt mount bracket, 75mm / 100mm VESA compatible mounting plate, (4) 4mm x 12mm fasteners (to attach monitor), and your instructions. 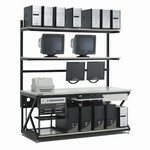 Performance 6U Panel Rack: An added accessory to the Accessory Bar. Portable Rack Locking Caster Kit: Medium duty (locking or non-locking) rack caster kit comes with four medium duty casters, and all the hardware necessary for mounting to any Kendall Howard Portable Rack System. Casters come with poly wheels to ensure they do not leave marks on tiled or other hard surfaces. Each caster will support 200 lbs (evenly distributed) giving your total caster weight capacity of 800 lbs per rack.